This savory scone is packed with bits of bacon, cheese, and chives. It is delicious on its own or cut in half and spread with butter. Makes a great accompaniment to soups and stews. Sometimes I use this scone to make a Breakfast Biscuit. Just cut the scone in half and fill it with a fried egg. You can also add a slice of tomato, a slice of avocado, and/or some lettuce. A few notes on ingredients. I have added bits of cooked bacon to the dough but you could add some chopped ham, crumbed sausage, or cubes of cooked pancetta. For the cheese, I have used grated parmesan but grated cheddar, gouda, or other hard cheeses can be used. Lastly, finely chopped green onion can be used instead of finely chopped chives. Buttermilk has a thick creamy texture with a rich tangy buttery taste that gives the scones a moist and bread-like texture. Whereas in the past buttermilk was made from the liquid left over after churning butter, it is now commercially made by adding a bacteria to whole, skim, or low fat milk. You can make a good substitute for commerical buttermilk by stirring 1 tablespoon of white distilled vinegar, cider vinegar, or lemon juice into 1 cup (240 ml/grams) of whole or reduced fat milk. Let stand at room temperature for about 10 minutes before using. Another option is to use buttermilk powder which can be found in some grocery stores or in specialty food stores. Bacon and Cheese Scones: Preheat your oven to 400 degrees F (200 degrees C) and place the oven rack in the center of the oven. Line a baking sheet with parchment paper. In a large bowl, whisk together the flour, sugar, baking powder, baking soda, salt, pepper, and paprika. Cut the butter into the flour mixture with a pastry blender or two knives until you have coarse crumbs. Stir in the grated parmeson, bacon, and chives. Add about 3/4 cup (180 ml/grams) of the buttermilk to the flour mixture and stir just until the dough starts to come together. Add more buttermilk, if needed. Do not over mix the dough or the scones will be tough. Transfer the dough to a lightly floured surface and knead the dough gently until it comes together. Form into a 7 inch (18 cm) round. Use a 3 inch (7.5 cm) round biscuit cutter to cut the dough into circles. Place the scones on the baking sheet spacing about 2 inches (5 cm) apart. Gather up any scraps, re-roll, and cut out the remaining scones. Brush the tops of the scones with cream or milk and top with a sprinkling of grated parmesan. 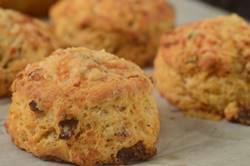 Bake for about 18 minutes or until golden brown and a toothpick inserted into the center of a scone comes out clean. Remove from oven and transfer to a wire rack to cool.